I feel like every month just flies by faster and faster! Between kicking off the start of another new school year, running three races, and battling my first illness of the school year, September just flew by! As I shared on Friday, fall is my least favorite season of the year (if it could be summer year round then I’d be really happy! ), but if October and November are anything like what September was like, then hopefully it’ll be winter before I know it! So how did I do with my September goals? 1. Run, walk, and elliptical a total of 50 miles. After running Rock ‘n’ Roll Virginia Beach, I did a great job scaling back my mileage this past month. My total mileage for September wound up being 54.7 miles. My body and mind definitely needed the mileage break after such an intense summer of half marathon training and logging over 80 miles in August. I barely practiced any yoga this past month. Granted, I spent part of the month sick, but still, I needed to do better. 3. Listen to my body. I did especially well in listening to my body when I first felt sick, and then while I was sick. Although I felt guilty at times about not working out, I allowed myself to rest when my body needed it. After focusing on these three goals this past month, I plan to focus on three very similar goals this coming month. 1. Run, walk, and elliptical at least 60 miles. Even with being sick last month, I was able to meet my 50 mile goal. After I run the Army Ten Miler, my cardio focus will shift from primarily running to a greater balance between running and cross training on the elliptical since I won’t be “in training” for a specific race. While I will likely start half marathon training again in mid-November (for a race that I’ll announce at a later date once I commit to it 100%), I still want to keep on top of my running while also giving my body and mind a small break from running. 2. Practice yoga at least once a week. Instead of making my goal to practice yoga throughout the month, I want to focus on something more measurable – doing yoga at least once a week. Hopefully this will help me to be better about making yoga a part of my weekly routine. I did a great job with this last month, and I want to continue to focus on this. Practicing yoga once a week will also help me to focus on relaxation and keeping my body and mind in check. QOTD: What are your goals for October? This entry was posted in Motivation, Training and tagged goal, goal setting, monthly goals, motivation. Bookmark the permalink. I love how simple this is. I’ve said that before, but I mean it. I think making a specific yoga goal is a great idea. Kudos to you for listening to your body while it was sick! Sometimes its better to keep things simple than to go for the complex. Good luck to you in reaching your goals this month! Great job on your goals Kathryn! 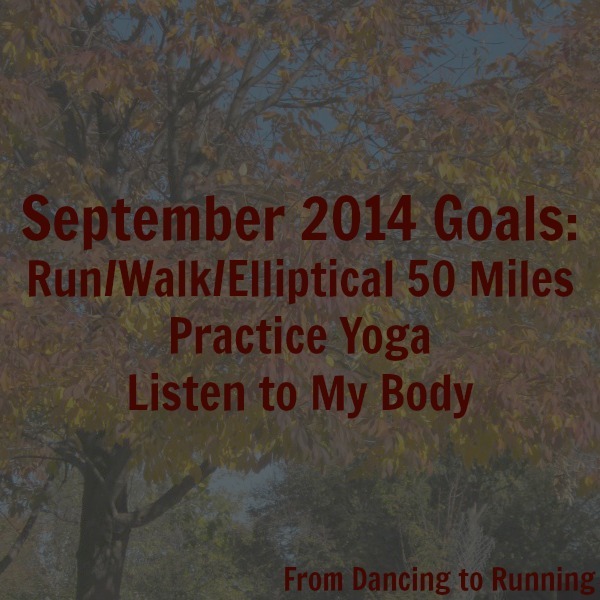 I love how you have reevaluated your yoga goal to make it more attainable! You’ll do great this month!!! That’s a great idea to make the yoga goal more measurable. That definitely helps me achieve goals. And I love that listening to your body is on the list. That’s one I really need to work on. It’s crazy how out of touch with my body I can be at times. Unfortunately, we often get so busy and don’t realize the messages that our bodies try to send us. 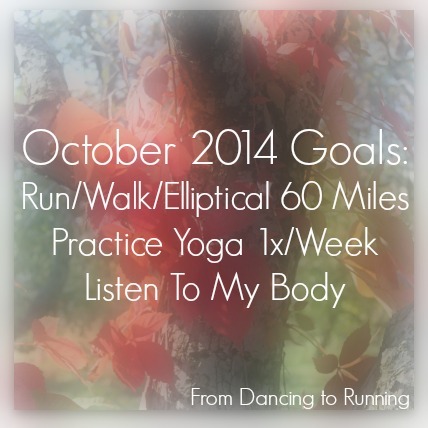 Goals for October…to get through the last 4 weeks of MCM training injury free! very nice goals!! and I’m with Sue, get through 25 more days injury and sick-free then MCM!! You’re going to rock MCM! Oh the last two replies are mine as well. I want to get through MCM without an injury and then my journey begins for the Boston Marathon. You’re going to do great with both races, Pam! Nice September Kathryn! That is a great idea to make your yoga goal more measurable, I know I have been truant on yoga as of late! Great stuff here! Great job keeping the goals specific, you go girl!